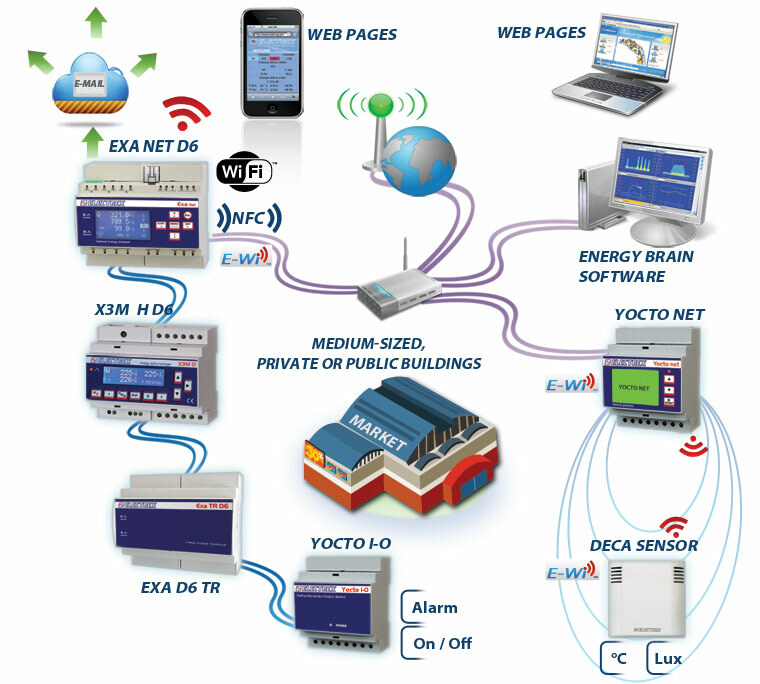 The Exa Net D6 is an Energy Analyzer & Wi-Fi Web Data Manager suitable for the energy efficiency applications in the medium-sized, private or public buildings for the power range between the 20kW and 200kW. It is the starting point for the continuous monitoring of the energy efficiency through the measure and the management of the energy (electricity, gas, water, ect. ), environmental (temperature, luminosity, CO2, etc.) and process parameters. The image above shows a part of the monitoring network of a shopping mall (but it is suitable also for an automobile repair shop, a dairy, a private offices building, a governmental building and in general buildings served by Low Voltage power supply). In this specific example the monitoring network has two branches. In the second branch the Yocto net coordinator uses a wireless connection for communicating with the various Deca Sensor E-Wi which monitor the ambient temperature and luminosity in the different areas of the building. 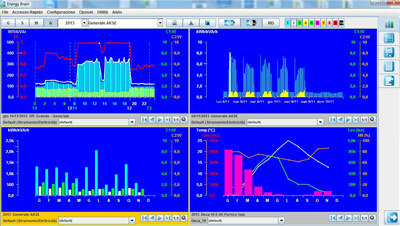 The shopping mall manager uses the Energy Brain software, installed on its PC, in order to control the energy consumption profiles and the environmental parameters. The Web pages displaying alarms and notifications, which are activated from anomalies or the exceeding of thresholds related to instantaneous measurements, are particularly useful for the maintenance team that can target and manage quickly the interventions.